Companies we are approved to supply include Lockheed Martin, Raytheon, Aurora Flight Sciences, Rexnord, UTC Aerospace Systems, and General Dynamics. 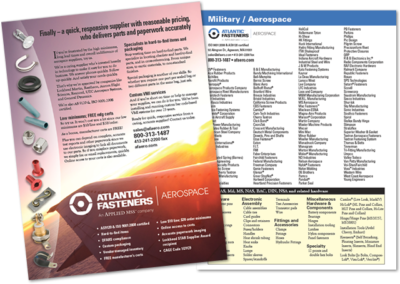 Atlantic Fasteners Aerospace is a stocking distributor specializing in aerospace, aircraft and mil-spec hardware to standards such as AN, AS, Mil, MS, NAS, BAC, DIN, NA, and NSA. Please download our quick read, two-sided line card and capabilities guide.